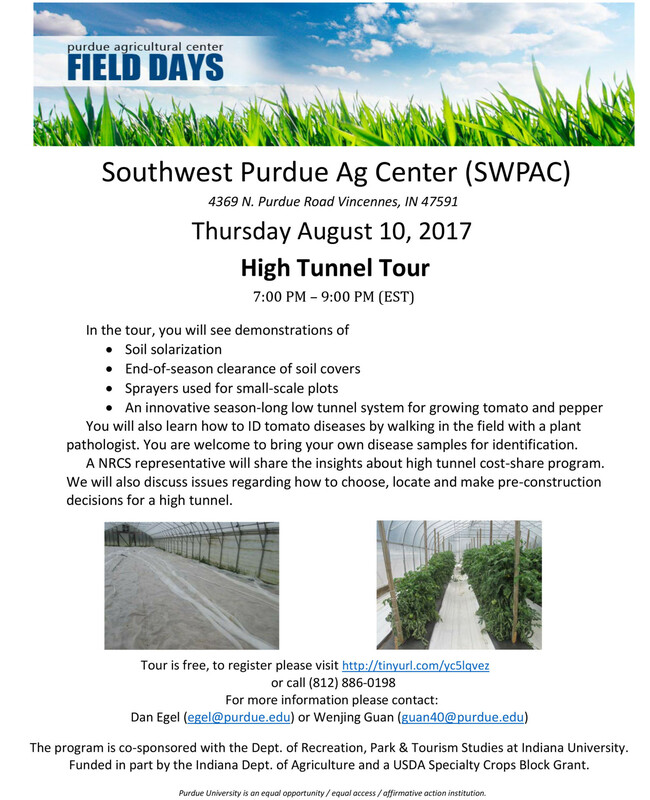 During the evening event at Southwest Purdue Agricultural Center, attendees will see demonstrations of soil solarization, end-of-season clearance of soil covers, sprayers used for small-scale plots, and an innovative season-long low tunnel system for growing tomato and pepper. Attendees will also learn how to ID tomato diseases by walking in the field with a plant pathologist. You are also welcome to bring your own disease samples for identification. A NRCS representative will share the insights about high tunnel cost-share program. We will also discuss issues relating to how to choose, locate and make pre-construction decisions for a high tunnel. 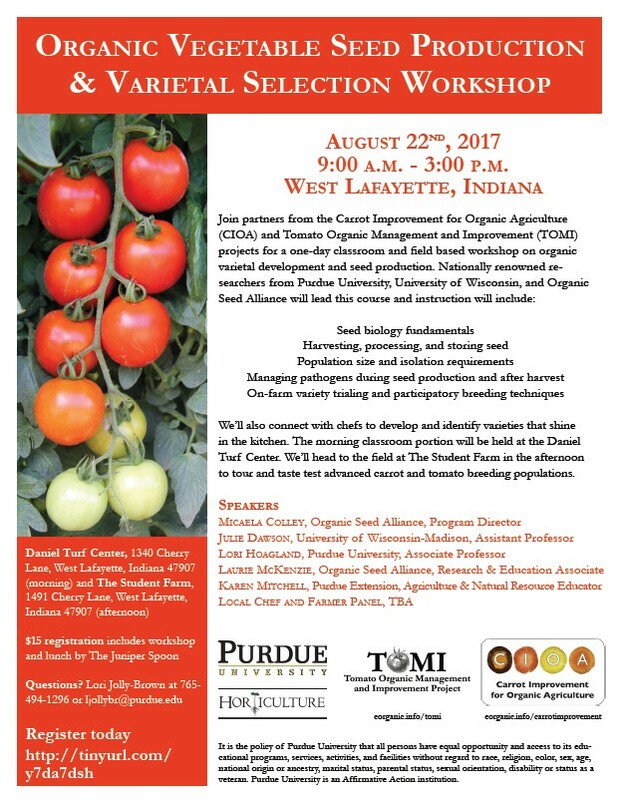 For more information, contact: vegcrops@purdue.edu or (219) 386-5232. 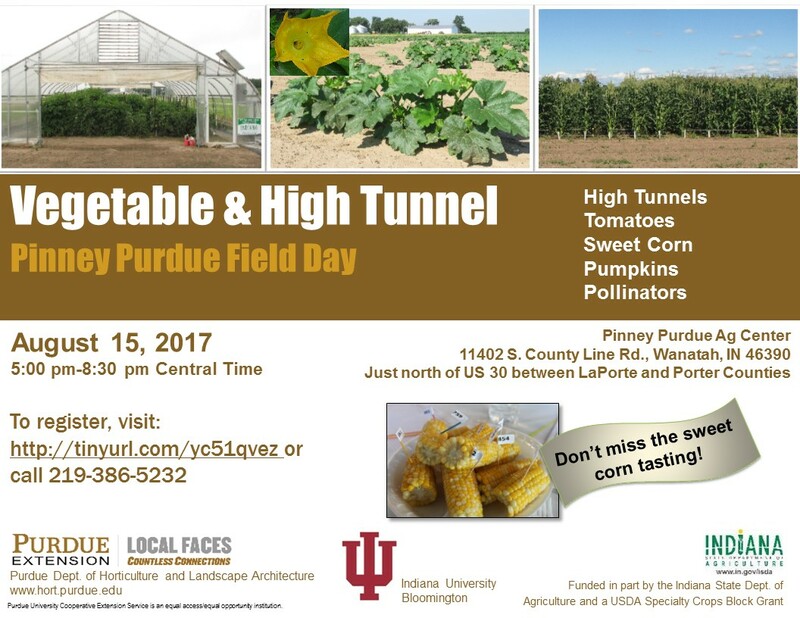 The Vegetable and High Tunnel Field Day at Pinney Purdue Agricultural Center will feature tours of tomato production in moveable high tunnels, using both conventional and organic management systems. 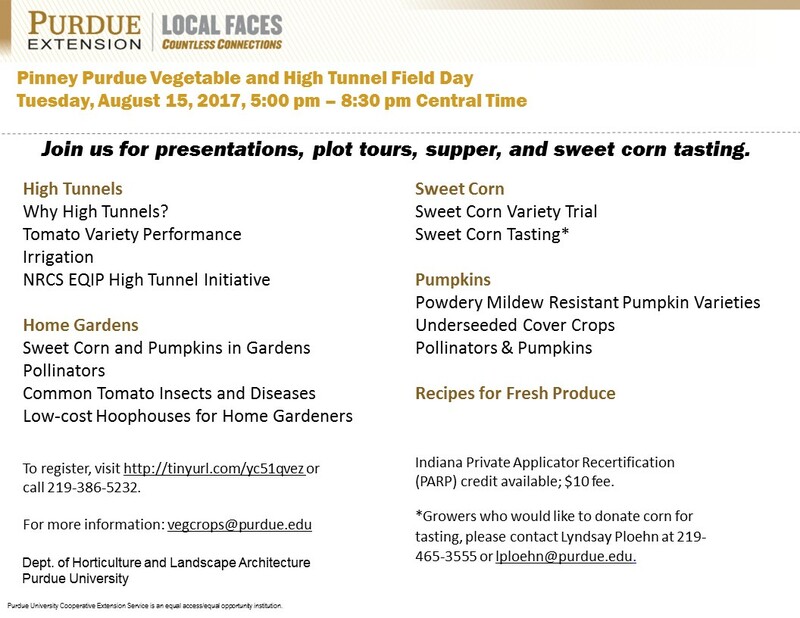 The event also will include walking tours of sweet corn and pumpkin variety trials, an overview of research findings about the opportunities available through high tunnels, and information about the NRCS EQIP Seasonal High Tunnel Initiative. Attendees will also learn about pollinators; low-cost high tunnel structures for the home gardener; irrigation in high tunnels; and ideas for using fresh produce in meals and snacks. Dinner and sweet corn variety tasting will follow the tours. Growers who would like to donate corn for tasting may contact Lyndsay Ploehn at 219-465-3555 or lploehn@purdue.edu. Indiana private applicator recertification credits (PARP) are available for a $10 fee. The event is co-sponsored by Purdue and Indiana Universities. Date: August 22, 2017, 9:00 am – 3:00 pm. Location: Daniel Turf Center, 1340 Cherry Ln, West Lafayette, IN, 47907. Topics include Seed biology fundamentals; Harvesting, processing, and storing seed; Population size and isolation requirements; Managing pathogens during seed production and after harvest; On-farm variety trialing and participatory breeding techniques. Registration fee is $15 including workshop and lunch. 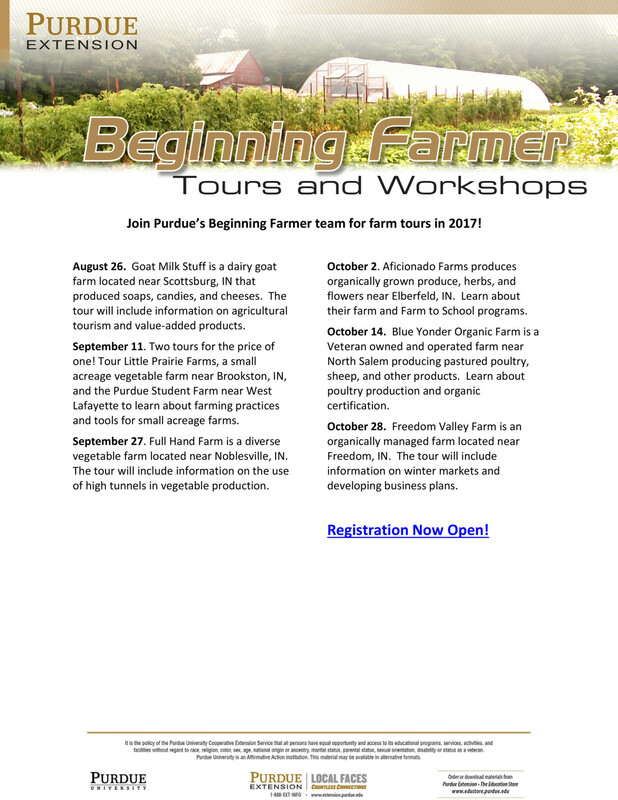 Join Purdue’s beginning farmer team for farm tours in 2017. September 11. Tour Little Prairie Farms, a small acreage vegetable farm near Brookston, IN, and the Purdue Student Farm near West Lafayette to learn about farming practices and tools for small acreage farms. September 27. Full Hand Farm is a diverse vegetable farm located near Noblesville, IN. The tour will include information on the use of high tunnels in vegetable production. October 2. Aficionado Farms produces organically grown produce, herbs, and flowers near Elberfeld, IN. Learn about their farm and Farm to School programs.